Home » Blog » Texting and Driving Accidents Continue to Plague Texas Streets. Find Out How a Car Accident Attorney Can Maximize Your Claim. Many people think it is safe to multi-task while driving. However, study after study has shown that being distracted while driving can greatly increase your risk of getting into a car accident. Texting is one of the worst distractions. If you text while you drive, then you are 23 times more likely to get into a car accident. If you have been involved in a car accident in the state of Texas and it was determined that the other party was texting prior to the accident it is imperative that you contact a Texas car accident attorney to represent you. Here is why texting and driving is a dangerous combination. The average driver will take their eyes off of the road for 4.6 seconds while they read a text message. They can drive the length of an entire football field before they put their eyes back on the road again. A study done by Human Factors also showed that texting is actually more dangerous than talking on the phone while driving. Many drivers make an attempt to divide their attention between the road and the conversation while they are talking on the phone. However, when a person is texting, 100 percent of their attention is on texting, which takes their eyes off the phone. 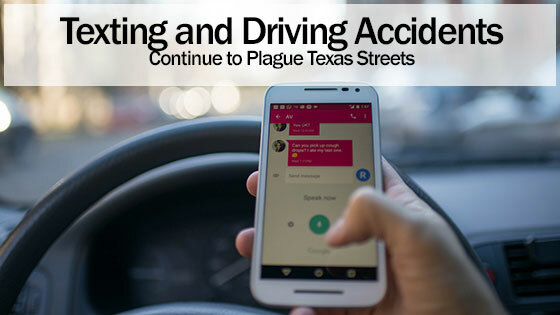 Texting played a role in 109,358 car accidents that occurred in Texas in 2017. It caused 405 deaths and 3,087 injuries. The Law Offices of David Kohm are committed to helping victims involved in car accidents resulting from the offending party being distracted because of texting. Because texting plays a role in 20 percent of the accidents, Texas is doing their part to crack down on this. On September 1, 2017, Texas legislator’s passed a law that made it illegal to do the following while driving. The only exceptions to this is when a person is in a stopped vehicle. Adults can use a hands-free device while they are behind the wheel. However, everyone who is under the age of 18 cannot use a cell phone while driving. What Happens if I Get Caught Texting and Driving? It is easy to see when someone is texting and driving. People who text while driving often swerve into another lane. They may also have a decreased reaction time. If a police officer sees that you have been texting and driving, then you may be given a ticket. The ticket for a first offense is $90. If it is your second offense, then the ticket may be $200. What Should I Do if I Need to Send a Text Message? If you are driving, then you will need to wait to send a text message. You can use a hand-free device if you are over the age of 18. If you have to send a text message, then you should pull over to the side of the road before you do so. It can be annoying to have to do this. However, that is a lot better than having to pay a fine for a text. It is also a lot better than putting your life and other lives in danger. If you have someone with you, then you can ask them to reply to your text messages. There are also apps that you can use that will automatically reply to the text messages. The sender will be informed that you are driving and will respond when you have finished driving. What if I Have Been Hit By Someone Who Was Texting and Driving? If you have been hit by someone who was texting and driving, then you will need a car accident attorney. Proving that the individual that you were involved with in a car accident was texting before your accident can be complex. An experienced lawyer will have dealt with these types of cases multiple times and understand what is needed in order to prove that the opposing party was distracted by texting and that is the reason why the car accident occurred. A car accident attorney can help you understand the strength of your case and whether or not you have a strong opportunity to receive compensation for your injuries.